For over sixtyyears, vacationers along Rt. 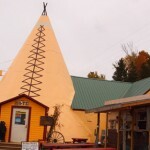 20 in upstate New York have marked their vacation stops by a visit to the souvenir and gift shop known as the Tepee. Of course you can see why it’s called the Tepee, but other than it’s exterior design, there’s little else for you, unless you’re looking for cheap t-shirts and crappy souvenirs… oh wait, that’s exactly what we’re looking for!